In Matthew 10:16 the Lord tells us to be as wise as serpents and as gentle as doves when fighting our enemies. Fighting child abuse can be a dangerous mission, especially when confronting or reporting an abuser. When we march to raise child abuse awareness, we are gentle as doves, like these people in Idaho. 1. BOISE — April is Child Abuse Prevention and Awareness Month, and Idahoans are taking notice. A small group marched from the Idaho Statehouse on Monday for the annual “Million March Against Child Abuse.” Similar marches were held across the country in a unified effort to bring attention to child abuse. “We’re on a mission to spread awareness about child abuse and how it’s in our communities and neighborhoods, and also asking our lawmakers that they put forth harsher punishment laws for those who do abuse children,” said Cory Hoffman with Million March against Child Abuse. Organizers say on average, 20 new cases of child abuse are reported in Idaho every day. Many believe more cases go unreported. Hoffman says it’s everyone’s responsibility to be on the lookout for child abuse and to call the number 211 if they want to report child abuse. From KTVB News. 2. A neighbor was as wise as a serpent when he video recorded a man abusing his step-son during a ball game. See the video on http://abclocal.go.com/wabc/video?id=8689626 .The video is being used in court as crucial evidence of abuse. 3. In Chicago, the father of one of two young children found with bruises after police responded to a disturbance in the East Chatham neighborhood has been charged with domestic battery, authorities said. Edwin Anderson, 28, was expected to appear in Domestic Violence Court for a bond hearing after police found a 1-year-old girl and a 3-year-old boy with visible injuries at Anderson’s home in the 8200 block of South Ellis Avenue, police said. Officers were called to the home in the 8200 block of South Ellis Avenue around 9 p.m. Monday, Chicago Police News Affairs Officer Amina Greer said. A neighbor reported possible child abuse at the home, police said. Officers found four children, 4 years and younger, in the home. Two of them had bruises, Greer said. Ambulances outside the home on South Ellis Avenue. Anderson fled the home out a back door before police arrived. Officers found the boy had bruising and welts, and the girl also showed marks, police said. Anderson was arrested when he returned, and police confiscated a black leather belt believed used to inflict the injuries. All four children were taken to the University of Chicago Comer Children’s Hospital, where they were listed in good condition. The children, three girls and a boy, range in age from 6 months to 4 years old, Greer said. The children’s mother was questioned by police but not charged, said Chicago Police News Affairs Officer John Mirabelli. The Illinois Department of Children and Family Services is investigating allegations of child abuse against a man who is the boyfriend of the children’s mother, DCFS spokesman Jimmie Whitelow said today. The mother is being investigated on allegations of neglect, he said. No booking photo of Anderson was released because he was charged with a misdemeanor. Unlike most misdemeanors, all domestic battery charges in Chicago, however, require a defendant’s appearance for a bond hearing. If you have been touched by Rick and his ministry, please pray this prayer out loud today. Dear Father God, You are the only one who can take this burden from our friends, Rick and his family. It is a heavy burden, but we know you can comfort them during this time. Based on our love and respect for this man of God and his family, we ask you to spread your Balm of Gilead onto their spirits, raining your love down on their souls. We lift up Matthew to you and hope and pray you will accept him into your heavenly house. Forgive him for anything that might prevent his entering into your holy presence. Father, this death affects so many, Christian and Non-Christian alike, and we all have felt Rick’s presence in the media. We ask you please to help him recover from this blow and be able to continue his ministry. The last few days have revealed his transparency, his faith and his strength, all of which you have given him abundantly. We pray that you would continue to gift him in these ways. Thank you for Rick and his family, and be with them before, during and after their memorial for their dear son and give them your comfort. I like to think all months are child abuse prevention months. We all should report any child abuse that comes to our attention by calling the abuse hotline or notifying police. However, April has been designated as Child Abuse Prevention Month in our country. Newlin said his organization is seeing a troubling trend – an increase in child neglect across the nation. In Texas, Children’s Advocacy Centers served more than 26,000 children last year. More than two-thirds of them reported sexual abuse, with the alleged perpetrator most often related to or known to the child. 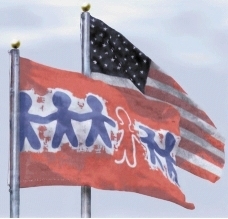 There are 24 Child Advocacy Centers in Ohio and many more in states around the nation. The Centers provide child abuse prevention training to more than a half-million people a year. The centers can be contacted if child abuse is suspected in your area. Working with local law enforcement, these centers help abused children recover and find more healthy living situations.